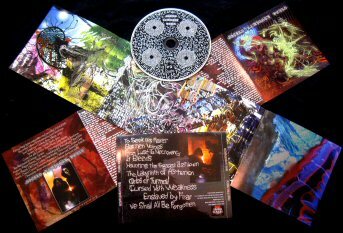 "Pulsing Feral Spire" features a professionally manufactured CD with full-color panoramic 8-panel CD booklet layout, and silver print overlay on all pages. The impressive cover artwork was once again conjured by famed horror artist ZORNOW. 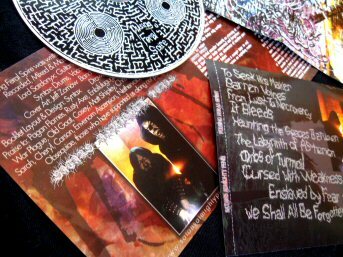 "Pulsing Feral Spire" is loaded with bizarre yet raw and vicious wild black metal attacks. S.A.P. once again decends to a new sub-level of swirling chaos and depravity enshrouded with downward-spiraling black metal weirdness. For listeners who previously shunned the band due to it's strangely ridiculous moniker (though no more ridiculous than the namesakes of countless other black metal acts), the music on "Pulsing Feral Spire" will prove undoubtedly that S.A.P. is deadly serious about their art, while fully embracing their - perhaps largely misunderstood - extremely dark and twisted sense of humour.